How Mr Zhang repaired my bicycle. Mapping socio-economic urban potentials in Nanjing. Over the past two decades China’s cities have undergone massive transformations and have grown in size, density as well as economic and cultural power. Yet the question arises whether such a boom will last; whether it is ecologically, socially and culturally sustainable, and whether it hasn’t already created a huge social and spatial uneven development and spatial inequalities within those cities and urban conurbations. 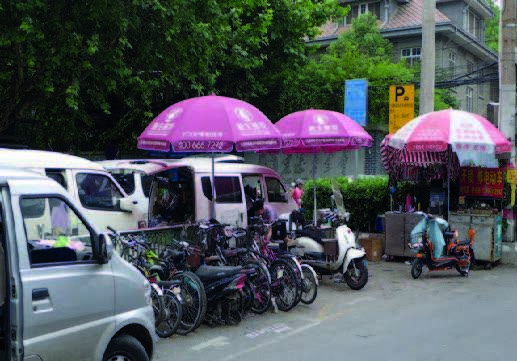 This talk reports from findings of a research workshop with Masters students at Nanjing University as well as a thesis studio at the Sheffield School of Architecture that both explored possibilities of Re-appropriating the Boom: in terms of design strategies and tactics that allow for current developments to change direction, to be used as drivers for a more sustainable and just urbanism; but also in terms of speculating how the constructions and artifacts of a vanishing Boom (unoccupied housing estates, empty shopping malls, disused factories) might be re-appropriated in the future. Dr. Florian Kossak is Senior Lecturer in the School of Architecture at the University of Sheffield. He studied architecture in Berlin and Glasgow and received a PhD from the University of Edinburgh. After a 7-year long collaboration with the Munich-based architect Otto Steidle, he co-founded the workers cooperative GLAS - Glasgow Letters on Architecture and Space in 2001. He has prolific experience in teaching (Munich, Strathclyde and Sheffield) and is currently the Director of Postgraduate Taught Masters Programmes. He is the co-author of Agency. Working with uncertain architectures and other books as well as journal articles and book chapters. He currently teaches Urban History, Theory and Design.